Home > Research > What is a PBT? Stolen Inventory (National): What is a PBT? DDT, PCBs, dioxins, and lead are examples of persistent bioaccumulative toxic chemicals, which are defined as compounds that "possess toxic properties, resist degradation, [and] bioaccumulate" [Stockholm 2004]. Possesses a degradation half-life (the time it takes for 50% of the chemical to degrade) in the water, soil, or river sediments of two months or greater. This rate of degradation means that the chemical will persist for at least one year in the environment. Airborne chemicals must possess a degradation half-life of 2 days or more, meaning that they last in the air for about 12 days. Bioaccumulates in the tissues of organisms either through exposure to the chemical in the environment (bioconcentration) or through uptake in food (bioaccumulation). The EPA has created a number of tests to measure bioaccumulation; if these tests show that a chemical accumulates at levels 1000 or greater times in an organism's tissues compared to environment or food levels, the chemical is considered to bioaccumulate. Are reasonably anticipated to cause serious or irreversible chronic human health effects at relatively low doses or ecotoxicity at relatively low concentrations. "...PBT chemicals have the potential to cause serious human health and environmental effect results from low levels of release and exposure. PBTs have been found all over the globe. They contaminate wildlife in the arctic, creatures in the sea, food on the grocery store shelf, and human breast milk and blood. They often persist for years, if not decades, in the environment and typically appear in higher, more dangerous quantities as they move up the food chain to higher predator species and ultimately humans. The toxic chemical hall of shame is dominated by PBTs—from DDT and PCBs to dioxin, brominated flame-retardants, lead compounds, chlordane, and a laundry list of banned chlorinated pesticides. PBTs are so hazardous that they are the only group of chemicals to be banned on a global scale by international treaty. The Stockholm Convention on Persistent Organic Pollutants which came into force in May 2004, bans or severely restricts the 12 most harmful. 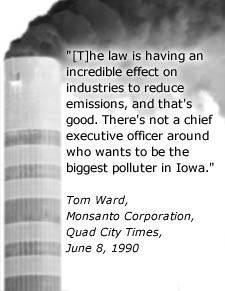 Even the Toxic Substances Control Act, widely recognized as the most feeble environmental law in the United States, banned the highly persistent, bioaccumulating PCBs, by statute, in 1978. And under TSCA, the EPA can restrict the uses of a new chemical, or even not allow it into production, if it meets the agency's PBT criteria [EPA 1999b]. In 2002 (the last year for which the public has access to data), EPA reported that it took action on 65 new potential PBT chemicals under its authority [EPA 2002b]. Because PBTs are generally recognized as highly hazardous, there is a special category for reporting PBT pollution under the TRI. Dioxin and lead are two examples of toxic compounds that are subject to tougher TRI reporting requirements for PBTs. In general these tougher reporting requirements demand reporting of far smaller amounts of emissions, which translates into information from a far greater number of facilities. Handle more than 10,000 pounds or manufacture more than 25,000 pounds per year of a chemical that is listed on the TRI. Emit to air, water or land or dispose of more than 500 pounds per year of the same chemical. If the company meets either the 10,000 or 25,000 pound threshold for handling or manufacture, but emits or disposes of less than 500 pounds per year, no pollution reporting is required, although a short form is required stating that the company handled significant amounts of the material. Under the PBT provisions, any facility that handles 100 pounds of a persistent and bioaccumulative chemical or just 10 pounds of a very persistent and very bioaccumulative chemical—a chemical that meets international guidelines for banning—is subject to full reporting of pollution and disposal. Dioxins are so toxic that companies handling more than 0.1 gram are subject to fully reporting (nationwide, only about 285 pounds are disposed of or emitted annually).